MenÄ&#x201C; crafts 24 karat gold and platinum jewelry sold by gram weight. By combining innovative technology, timeless design, and radical transparency, MenÄ&#x201C; restores the link between jewelry and savings. I N V E ST MenÄ&#x201C; is the most attractive investment you can make. It is not a frivolous purchase. Itâ&#x20AC;&#x2122;s an investment in love, family, friendship or just fun. It is jewelry of precious value that endures overtime. Every piece is crafted from pure 24 karat gold and platinum, and sold by weight with a minimal design fee. Through mene.com, customers may buy, sell or exchange jewelry at prevailing daily prices for gold and platinum. So as your love grows, so does your investment. IN PURE MenÄ&#x201C; jewelry is crafted from pure 24 karat gold and platinum. The purest gold and platinum jewelry you can purchase. The look and feel is easily discernible from any other jewelry crafted from a gold of lower purity. Pure 24 karat gold is beautiful in its radiance, in its weight, in its timeless feel â&#x20AC;&#x201D; the perfect expression of the pure love in your heart and in your life. LO V E MenÄ&#x201C; 24 karat jewelry is born out of pure love. Pure love for design, for style, and for expression. Love in its purest form is a higher state of beauty, and perfection. The purest way to express your feelings to family and friends is to give and wear jewelry that is as pure and precious as your love for them. FA I L I N G O N P U R I T Y Man-made chemical alloys of 14-18 karats (58%-75% pure) have become the most common jewelry marketed and sold. Alloys do not exhibit the natural properties of gold and platinum and even tarnish with time. FA I L I N G O N T R A N S PA R E N C Y The precious metal weight and value are almost never disclosed. This lack of transparency is what enables modern jewelry brands to earn up to 80% of the original purchase price as revenue and is why modern jewelry fails to maintain its value. FA I L I N G O N S C A R C I T Y The modern jewelry industry has also ascribed nonexistent intrinsic value to diamonds and gemstones, causing consumer confusion when it comes to what is truly rare in nature. Diamonds and gemstones are merely crystals of Carbon (C), one of the most abundant elements, and Aluminum Oxide (Alâ&#x201A;&#x201A;Oâ&#x201A;&#x192;). Sadly, diamonds have played an important role in the declining value and increased price subjectivity of modern jewelry. 24 K A RAT P U R I T Y MenÄ&#x201C; jewelry is crafted from pure 24 karat gold and platinum, the same form that these precious metals are found in nature. The difference in purity over man-made chemical alloys of 14-18 karats (58%-75%) is instantly observed and felt. It also means our jewelry is hypoallergenic and antimicrobial. There is a myth that jewelry cannot be crafted from pure 24 karat gold due to its softness. While it is true that pure gold is more malleable than other metals and may contour to your body, gold is indestructible and will not tarnish. This special quality can only be understood when experienced physically, leading to an appreciation of this authentic purity as superior to any element in nature. RA D I CA L T RA N S PA R E N CY Menē jewelry is sold by the gold and platinum weight value plus a transparent design and manufacturing premium. This premium is around 20% of the precious metal value each day. The result: a $500 Menē ring will have at least $400 in gold or platinum value at the time of purchase while $100 is the revenue earned by Menē. STO R E O F E N D U R I N G VA L U E By avoiding gems and diamonds, the pieces we design are homogenous as pure gold and platinum leaving no doubt as to their long-term precious metal value. As the value of MenÄ&#x201C; jewelry is essentially a weight of pure precious metals, the jewelry can be exchanged or sold in the future as easily as it was purchased. We stand behind this value by offering the MenÄ&#x201C; Guarantee which allows you to sell or exchange your jewelry at the daily precious metal value less a 10% fee. We also provide an innovative dashboard to keep track of your collections real-time value. For every gram of gold or platinum on earth there are 60 grams of silver, 5,000 grams of saphires, and 400,000 grams of diamonds. E T H I CA L LY SO U R C E D G O L D A N D P L AT I N U M MenÄ&#x201C; jewelry is crafted from pure gold that is ethically sourced from gold mines in Nevada, USA and Ontario, Canada. Our gold carries the coveted London Bullion Marketâ&#x20AC;&#x2122;s Responsible Sourcing Certification. Additionally, we only source metals mined by publicly traded precious metal miners who are held accountable to stricter environmental best-practices. We specifically audit these mines to ensure there is little disturbance, minimal impact to local communities, and a reclamation plan that ensures former gold mines will be terraformed back to nature within two decades or less. C H A R MS Crafted in 24 karat gold and platinum, MenÄ&#x201C; charms are timeless heirlooms, beautiful art pieces, and trustworthy investments. Stylish as a single charm or as many, on a bracelet or necklace, our special charms empower you to celebrate your personality and make memories permanent. CHAINS MenÄ&#x201C; 24 karat gold and platinum chains are incomparable in their weight and radiance. These chains are proudly made in America and come in both bracelet and necklace lengths. Chains can be worn on their own or as foundations for MenÄ&#x201C; Charms and Pendants. BANDS MenÄ&#x201C; Bands are timeless classics exceptionally crafted in the ancient tradition. Radiant and Pure, MenÄ&#x201C; 24 karat gold and platinum bands are perfect as an eternal symbol of enduring love, or as a reminder of that special occasion or cherished memory. RINGS MenÄ&#x201C; rings are the quintessence of design, combining elegance with the timeless and radiant luster of pure 24 karat gold and platinum. Available in myriad designs to fit every style from traditional bands to unique pieces for everyday wear and special occasions. P E N DA N TS MenÄ&#x201C; 24 karat pendants are an opportunity to begin a legacy that will shine bright and endure. More than an investment, they are a link between past, present, and future. Pendants can be worn on MenÄ&#x201C; Chain Necklaces or with our complimentary leather cords. B RAC E L E TS Crafted from pure 24 karat gold and platinum, the timeless allure of a MenÄ&#x201C; bracelet completes any look. From wear-anywhere designs to stunning statement pieces, each bracelet and cuff is elegantly styled to ensure flawless fit and endless enjoyment. G I F TS Whether youâ&#x20AC;&#x2122;re looking to surprise someone special or celebrate a significant milestone, give the gift of timeless 24 karat gold and platinum luxury with beautiful MenÄ&#x201C; designs. MEET OUR DESIGN TEAM Menē designs are born from true love. Love of art, history, and design. Renowned art historian Diana WidmaierPicasso and multifaceted designer Sunjoo Moon met while both living in Paris and have been close friends for decades. Their mutual passion for art, history, and design motivated them to join forces as a creative team for Menē. Combining their extensive experience in their respective fields while working closely with skilled craftsmen to fully realize and utilize the elements of pure gold and platinum led to the creation of timeless pieces that have a look and feel unlike any other brand of jewelry. Diana and Sunjoo draw inspiration from antiquity for their designs in pure metal; artists have been paying homage to and creating with gold since the beginning of time. The ancient Egyptians believed it conferred immortal power and there’s no doubt that the dynamic Menē design team has captured yet enhanced both the modern and ancient spiritual values of 24 karat precious metal. 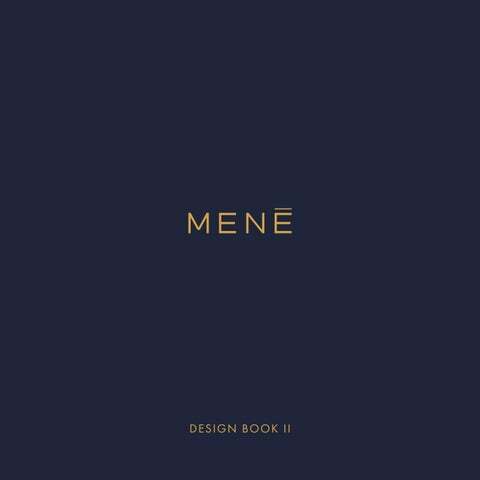 The word Menē (pronounced “meh-ney”) is an ancient Aramaic word that has a deep meaning, reminding us of the immutable link between jewelry, gold, and long-term savings. The Menē, reﬂecting 567 grams of pure gold, is the ﬁrst written word for “money” as codified in the Codes of Hammurabi and Ur-Nammu 4,000 years ago. For most of written history, the term “money” has always meant a standard weight and purity of gold or silver. Whether worn as jewelry or kept in a satchel as exchangeable coins. These natural precious metals formed the basis of long-term savings, outlasting quickly decaying commodities and enabling trust and cooperation amongst diverse communities with different skills. P RO D U C T CA R E Menē jewelry is fundamentally different from most jewelry because it’s crafted from pure 24 karat gold and platinum. Your Menē jewelry will transcend time and retain its flawless luster forever if cared for properly. Gold is one of nature’s most exceptional elements. It’s beautiful, radiant, does not tarnish or decay, and will shine for thousands of years regardless of whether its stored in a vault or at the bottom of the ocean. Gold’s unique properties make it easily discernible from every other metal and substance, which is evident when simply comparing the look and feel of your 24 karat Menē jewelry to any piece of jewelry crafted from 18 karat gold alloys or metallic alloys of lower purity. Another distinctive characteristic of gold is its relative softness to other metals, which was appreciated as a symbol of purity and authenticity for thousands of years. You will find that pure 24 karat gold jewelry is generally quite malleable. Your 24 karat gold Menē jewelry will form fit to your wrist, neck, or finger over time with everyday wear, making it special, valuable, and unique to you. Should you wish to maintain the original condition of your Menē jewelry, we recommend wearing it on special occasions and ensuring it’s stored correctly after each use. M A I N TA I N I N G YO U R M E N Ä&#x2019; J E W E L RY Remove your jewelry prior to washing your hands and cleaning to prevent contact with chemicals or abrasives such as bleach that may cause discolouring. You should also remove your jewelry before exercising or engaging in physical activity that could lead to scratches and dents. Avoid applying perfume and makeup while wearing your jewelry, as certain ingredients contained in cosmetic products can be harmful. STO R I N G YO U R M E N Ä&#x2019; J E W E L RY To best preserve your gold jewelry and prevent scratching, ensure you are storing it separately from other jewelry in its original pouch when not in use. Additionally, secure clasps and closures prior to storing your jewelry to avoid scratches and tangled chains. CA R I N G FO R YO U R M E N Ä&#x2019; J E W E L RY Care for your jewelry on a regular basis by wiping it with a cotton cloth after wear, then store it separately from other jewelry in its original pouch. On occasion, you may find it helpful to gently soak your jewelry in warm water and mild dish detergent to remove everyday pollutants that could cause your gold jewelry to appear dull. Ensure you properly dry your jewelry after self-cleaning prior to wear or storage. Should you wish to have your jewelry professionally cleaned, please locate a local jeweler who is trusted to properly handle and care for gold. L I F E T I M E G U A RA N T E E Our certified buyback guarantee enables you to exchange or sell your Menē jewelry at any time for its realtime value less a 10% buyback fee. Your account will be credited within seven business days upon receipt of your package. You may earn the value as Menē Credit, deposit the amount to your PayPal or Goldmoney account, or have a cheque mailed to your address. Once you initiate a buyback via your Menē Dashboard, you will receive a discreet prepaid shipping envelope within three to five days time. Please ensure your Certificate of Authenticity is enclosed with your item to avoid incurring an additional 5% assaying fee. Menē (TSXV: MENE) crafts pure 24 karat gold and platinum jewelry that is transparently sold by gram weight. Through Mene.com customers can buy jewelry, monitor the value of their collection over time, and sell or exchange their pieces by gram weight at the prevailing market prices for gold and platinum. Mene Inc. is backed by Goldmoney Inc. the world’s largest gold bullion custodian and payments network which owns a 35% stake in the company as well as several leading global institutional investors. Menē was founded by Roy Sebag and Diana W. Picasso with a mission to restore the relationship between jewelry and savings, empowering consumers by crafting pieces which endure as a store of value. Our experience in the precious metal industry along with our online business model allows us to avoid many of the costs that are typically incurred by traditional western jewelry brands. As a result, we are able to realize lower profit margins while remaining financially viable. ROY S E B AG Founder, Chief Executive Officer Roy Sebag is the Founder and Chief Executive Officer of Menē Inc. (TSXV: MENE). 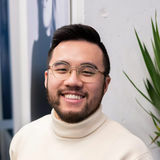 Mr. Sebag is also the Founder and Chief Executive Officer of Goldmoney Inc. (TSX: XAU), the world’s largest precious metal savings, payments, and custody platform overseeing nearly $2 billion of precious metal savings for over 1.5 million clients worldwide. D I A N A W I D MA I E R P I CASSO Co-Founder, Chief Artistic Officer Diana Widmaier Picasso is an art historian and curator specialized in modern and contemporary art. She holds a master degree in Art History (Paris-Sorbonne) and a master degree in business law (Paris-Assas). She is the author of the forthcoming catalogue raisonné of Pablo Picasso’s sculptures.